The Hershey Bears collected a 3-0-1-0 record in a four-game homestand over the past week, improving the club’s record to 36-22-3-4, just two points back of second place Bridgeport. Hershey is on a seven-game point streak (4-0-2-1), and with 11 games remaining in the regular season, the Bears magic number to clinch a playoff berth is 16. The Bears close this week out with a pair of road games at Cleveland, before returning home to the Giant Center to end the month on Mar. 30. In Saturday’s contest, Hershey dominated from start to finish, beating Bridgeport 5-1 at Giant Center. Sgarbossa had a career-best four points, while Riley Barber tallied two goals and an assist. The Bears are committed to giving back to the local community. The 7th annual Running for Rachel event with Arooga’s took place on Mar. 20 and helped fight cancer. Players also visited the PennState Health Children’s Hospital for the final time this season this past Monday. TERRIFIC TURNAROUND: Heading into Hershey’s game on Jan. 12 at Lehigh Valley, the Bears were in last place in the Atlantic Division at 15-20-0-2. Since then, the Bears have gone on a remarkable run, collecting points in 26 of the past 28 games, posting a 21-2-3-2 record, good for an exceptional .839 points percentage. In that time, Hershey has lowered the club’s goals against per game from 3.41 (26th) to 2.92 (11th). Netminder Ilya Samsonov is 12-1-1-1 with a 1.64 goals against average and .934 save percentage in that span. Mike Sgarbossa has led the charge for the Bears offensively, collecting 30 points (11 goals, 19 assists) in the impressive stretch that has turned Hershey’s season around. HOME COOKING: After a strong homestand, Hershey is now 12-1-1-0 in the club’s last 14 games at Giant Center. Hershey’s 22 wins on home ice are the most in the Atlantic Division and tied for second in the AHL, only trailing Syracuse’s 23 home wins. Hershey is 22-10-1-1 at Giant Center this year. BARBOSSA CONNECTION: Hershey forward Riley Barber scored twice in last Saturday’s win to give him a league-leading 31 goals this season. Barber has enjoyed great chemistry with linemate Mike Sgarbossa all season. Sgarbossa has assisted on 17 of Barber’s goals this year, with 12 helpers being the primary assist. Sgarbossa and Barber each have a career-high 58 points on the season, a mark good for fifth in the AHL’s scoring race. GARRETT’S GOT IT GOING: Forward Garrett Pilon enters the week with goals in three straight contests. The rookie forward started out of the gate slow, tallying 11 points (two goals, nine assists) in 34 games in 2018, but has turned on his scoring touch since the calendar flipped to 2019, gathering 19 points (eight goals, 11 assists) in 31 games. He leads Bears rookies with 30 points. 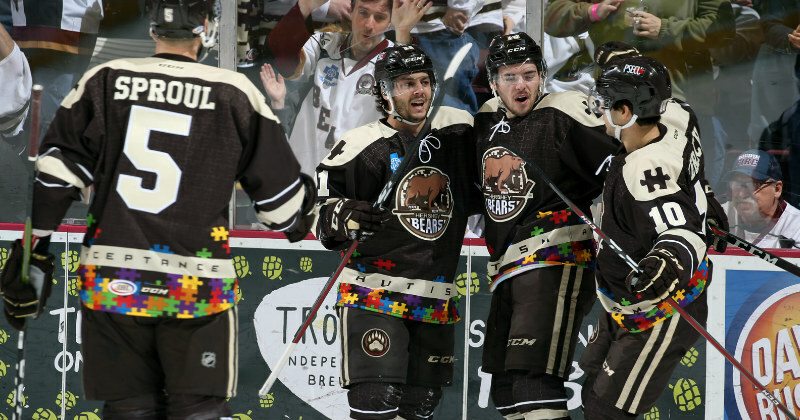 BEARS BITES: This weekend’s visits marks Hershey’s first visit to Cleveland since the Bears dropped Games 3 and 4 of the 2016 Calder Cup Finals to the then Lake Erie Monsters…Aaron Ness’ 43 assists lead all AHL defenders, and his 47 points this season are a new career-best…The Bears have points in five straight road games, going 2-0-2-1 in that span.